There’s been a lot of buzz around ‘the customer experience’. Customer experience is the sum of all interaction your company has with a customer from the time they discover your product through to post-sales support interactions. Providing a consistently good experience to customers isn’t a new idea. Why then is the customer experience important all of a sudden? Because ubiquitous internet means you can’t get away with anything anymore. Marketing can’t embellish what your product does when review sites tell the truth. You can’t keep bad customer service a secret when people post it on social media and it goes viral. This trend will only get more pronounced as millennials followed by the digital natives become a larger segment of the population. Customer experience is aligning marketers, product managers and support staff to think about meeting customer expectations to keep customers happy and get new ones through digital word of mouth. When in the past marketers focused on messaging and brand, today they are thinking about developing advocates who will share positive customer experiences. Support teams, instead of focusing on shortening handle times and cost per interaction, are starting to think about how to deliver support in a way that boosts NPS scores. 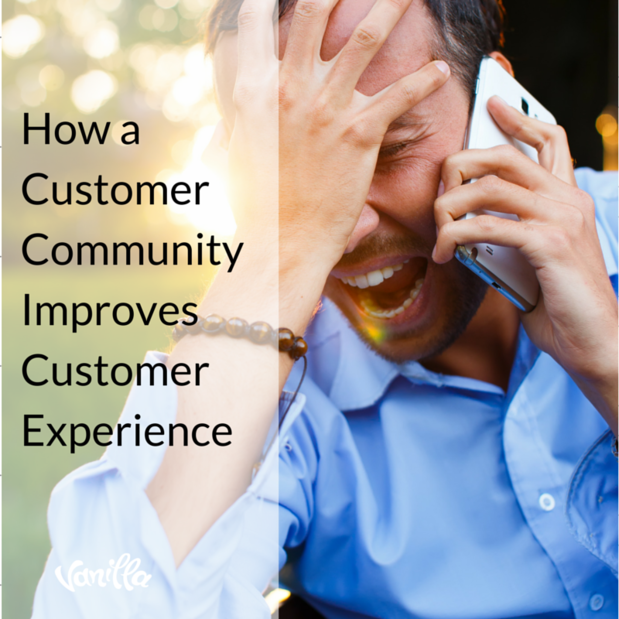 How can a Customer Community Help Deliver a Better Customer Experience? Your strongest brand advocates are going to seek out your community to evangelise about your products. A community allows you to identify these users and encourage their advocacy, creating strong bonds between you. This doesn’t just reinforce their own loyalty, it also allows them to counteract negative users and disproportionate outrage with their own positive experiences. These interactions will even spill out of the forum into other social media. Whether you sell barbeques, video games or marketing automation software, the utility of your product is increased when people know how to use it. Scaling the sharing of best practises is difficult; even the best marketing teams don’t have infinite resources. A community allows your experienced uses to to share their knowledge with new customers. This creates a huge knowledge base about your product, ready for any prospective customer to google. What’s more, as they share they continue to build social bonds and strengthen their ties to your product. Surveys show that millennials will only make a call or send an email as a last resort. They’re much more comfortable looking things up themselves on Google. A customer community feeds into this need by building a huge knowledge base that far exceed what your can enter into a knowledge base application. This deflects tickets from your call centre and saves you money, while giving your customers the all important self-serve channel that they need. In this new world of ‘show me, don’t tell me’ a prospective customer can get real insights from reading interactions in your community. The community provides more nuance and breadth than can be found on review sites or social media searches. Some companies might be hesitant to accept the transparency that comes with a public community, but those that do will be rewarded. Prospective customers will invest themselves in you if you give them the chance to learn more about you through the community.